So the other articles leading up to this one have been kind of easy, kind of hard, maybe a little more than one person should process on a single run through. I can’t say for sure, but since fun feels less like work, let’s take this opportunity to add a few odd words to our study vocabulary and learn a little bit about culture. Let’s do a little less vocabulary and grammar today and focus a little more on discussion about Japan. Sam: Tomomi-san, “ghosuto hausu” te itta koto aru? Tomomi: Obake yashiki no koto kana? Koukou no bunkasai de kurasu de tsukutta yo. Sam: Donna no tsukutta no? Tomomi: Zonbi ni nattari toka. Tenjou kara kon’nyaku o tsuru shitari toka. Sam: Nani o tsuru shita no? Tomomi: Aa, wakaru kanaa. Tabemono de katai jerri mitaina mono. Kao ni attatara, kimochi warui ne. Sam: Sugoina! Hoka ni wa? Tomomi: Chisana honou mitai nan dakedo, shinda ningen no tamashii no koto dayo. Tomomi: Do you mean a haunted house? When I was in high school my class made one for the cultural festival. Sam: What was it like? Tomomi: There were zombies. And they hung kon-nyaku from the ceiling. Tomomi: You know. It’s like hard jelly. And it’d hit you in the face and was gross and slimy. Sam: Was there anything else? Tomomi: Well we had hito-dama. Tomomi: They’re like fiery little balls that represent the souls of dead people. When in doubt try it in katakana is something I’ve mentioned directly and indirectly a few times, and we see it here again as Sam katakan-izes “ghost house” in trying to elicit the idea of a haunted house. All these scripts have been run by Japanese friends to make sure the phrasing and grammar were as natural as I could get them, while still being useful for the topics I wanted to delve into—or at least glimpse through a keyhole. I mention this because when I used the term “ghost house” in katakana one of the responses I got was that “ghost house” in katakana English referred to “actual” haunted houses, or houses that were really believed to be haunted, as opposed to お化(ば)け屋敷(やしき) for the kind of haunted houses that are setup for Halloween. I wouldn’t go so far as to say that this is a universal sentiment, and it would have to be a fairly recent development in the language. Regardless of its degree of penetration, it’s a good reminder that connotation can be tricky but language is also remarkably fluid. Of course お化け屋敷 comes from combining お化け for ghost and 屋敷 for residence or estate. 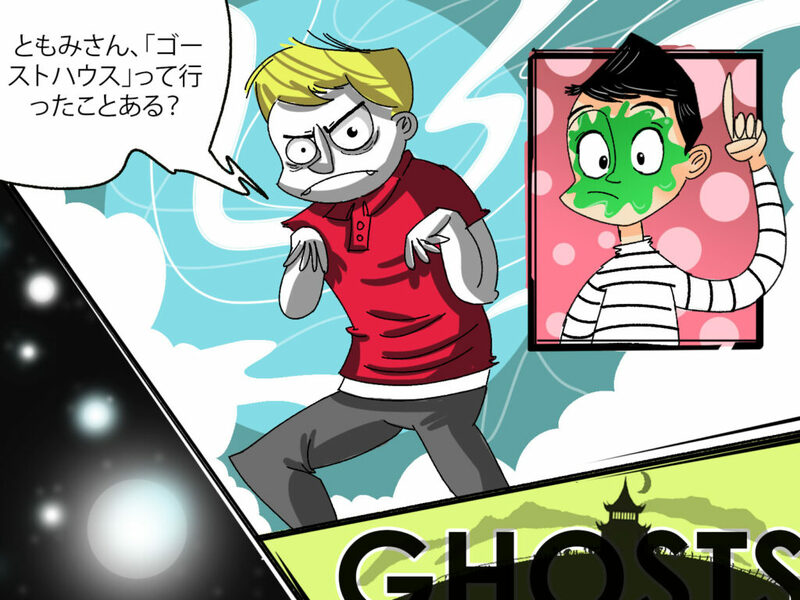 While お化け or ゴースト is most often used for ghosts, you may have heard the term 化(ば)け物(もの) in several manga (perhaps, most notably 化(ば)け物語(ものがた)り, which is literally “monster/goblin stories.” These are kind of the general terms, though of course Japanese has much more specific categories for monsters as well. I won’t get too much into that here, but if you have an interest, there are many resources out there and learning about a culture’s monsters, ghosts, and ghouls can provide interesting new perspectives. You can look up 蒟蒻(こんにゃく) if you need a picture. It’s a kind of jelly that’s actually pretty good with mustard, in my opinion, and it’s really healthy. I asked around about what kinds of things my Japanese friends included in their high school ghost houses, and hanging this jelly from the ceiling to smack you in the face seems to be the equivalent of when I was a kid and we put cold spaghetti in a jar and called it brains or organs. I kind of prefer this version. The mental image alone makes me think of all the gooey toys that were in vogue when I was growing up. Last, I’d like to mention 文化祭(ぶんかさい) or cultural festival/day. Each class (because students stay in their classrooms and each subject’s instructor comes to them) devises their own attraction for the day, and then family and community members come to take part in the festivities. If you’ve seen any anime set in a Japanese high school there is always at least one obligatory cultural festival episode. They’re pretty awesome and much better for teaching kids to collaborate than those 4-person group assignments where Larry never does his research or write his portion of the paper (seriously Larry, come on!). So in A you have a comparison being made that works kind of like build your own adjective. First you say your description, then みたいな, and then finish with the thing you’re talking about. In B and C the sentence ends with みたい, so the な gets dropped, and the meaning is more about what seems to be so. “Look” in both instances could just as easily be “seems”: you don’t seem well; it seems I’ve eaten too much. This is obviously a little different than its usage in A. Also notice in A the comparison is two nouns, in B みたい follows an adjective, and in C it follows a past tense verb. This is important because if you use みたい with a て-form verb, it means “to try” something; e.g. 食べてみたい means to try eating something, like a new food. One of the topics that occasionally comes up amongst students of Japanese is about how the economy of effort behind kanji seems somewhat untenable. Now, usually this has to do with memorizing all of them, but until you really get used to writing them—and many people never do thanks to the marvelous advent of word processors—all those strokes seem unnecessary to relay relatively little information. For example, above we have 気持ち, which when written in hiragana is きもち. Writing the word in kanji doubles the number of strokes involved. Of course Japanese is a language of homonyms, and once you’ve grown accustomed to kanji, going back and trying to read something written mostly in hiragana is just a headache. So I intend this as a bit of a pep-talk. Studying and learning kanji is worth the effort. You’ll get to the top of the mountain, and it will be glorious!